Shooting 'Up Up and Away' into the blue skys of... wait, what? 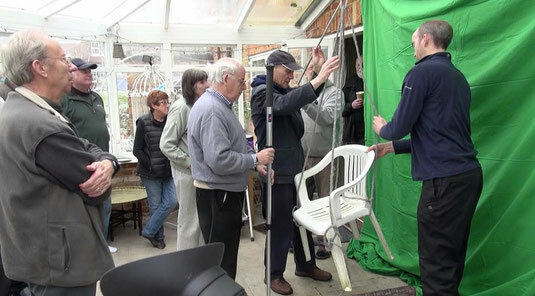 We planned to have a technical rehearsal for Up Up and Away on Saturday 17th March with the actual shoot date on 18th - weather permitting. Well, weather did not permit. With snow expected and freezing temperatures we decided to postpone the shoot date until the following Sunday, 25th March but went ahead with the technical rehearsal on 17th. 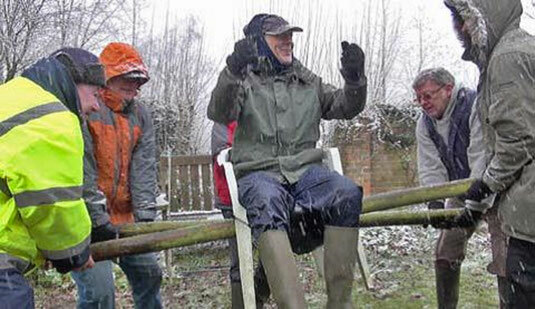 A number of challenges faced us, mainly involving the chair lifting into the air with actor (Brian O’Connell) on board. It was time for the game to commence in trial terms so we trooped out to inspect the pitch. An azure sky filled with puffy clouds. Rita discusses the chair lift with Geoff Bentley, tree surgeon, who knows all about pulleys and knots. She also wanted to try out lifting the chair on poles. 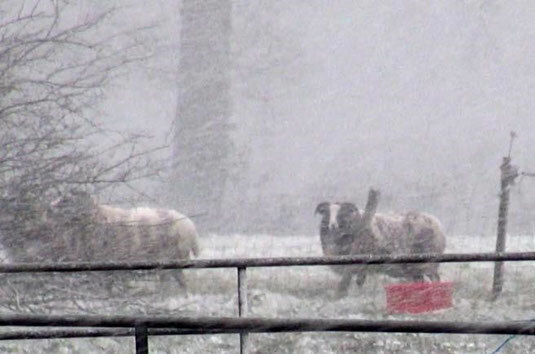 It was at that point we decided to return the sheep to the field and for us to go indoors. We then had some fun trying out the green screen. And Brian practised falling from the chair. 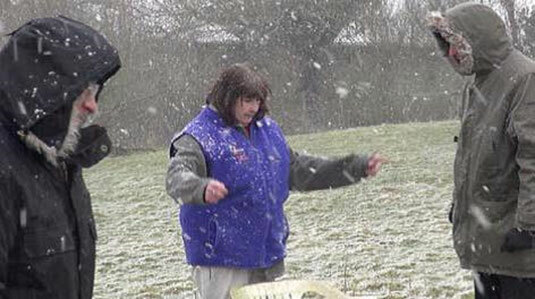 We did manage to film on Sunday 25th March despite strong, and very cold, wind. More on that later. 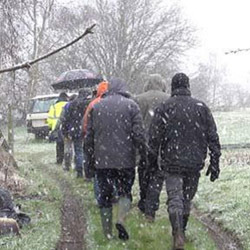 Bravo to these filmmakers for not letting the weather prevent the film from being made. True filmmakers, in my opinion. We faced a similar situation last summer, only it was soaring temperatures, not snow and ice. It was 108F outside when we shot Pluto, but inside the garden shed where the "time machine" was kept, the temp rose to a whopping 118F. Our actors and crew were real troopers. I can't wait to see this film, now for two reasons: the first being that I thought no one would try to tackle it because of its complexity, and the second because this lot knows the true meaning of filmmaking. Best wishes to you all.